Vomitory was a Swedish death metal band formed in 1989 by guitarist Urban Gustafsson and bassist Ronnie Olson. The band released a total of eight albums, and was last signed to Metal Blade Records. 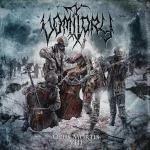 In February 2013, Vomitory announced that it will be disbanding by the end of 2013. The band's final show was on December 27, 2013.